DNA codes for life as we know it, but in recent years, scientists have discovered more uses for the molecule. Because DNA is foldable and “sticky,” they’ve begun making microscopic shapes called DNA origami. Over the last decade or so, researchers have improved at this DNA art, and now, Caltech scientists say they used DNA to sketch a glowing masterpiece — a replica of Vincent van Gogh’s famous painting “The Starry Night”— on a canvas the size of a dime. 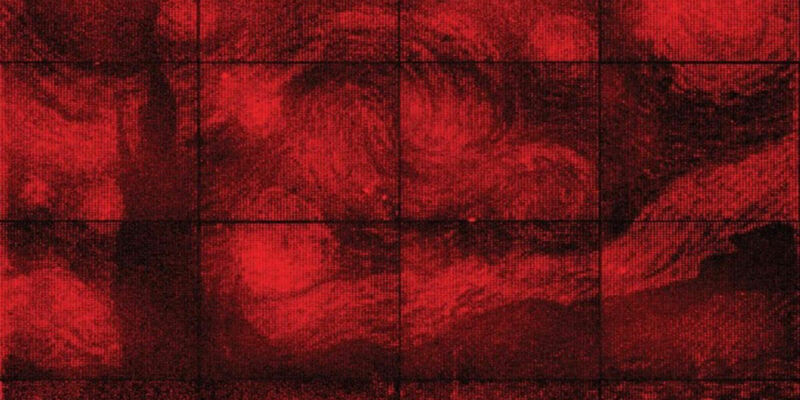 While the mini-van Gogh is neat — if a little fuzzy and monochromatic — the demonstration shows the technique may be approaching more practical uses. One of the difficulties of making technologies ever-smaller is figuring out how to precisely place components. As it turns out, our fingers are just a little too fat to build on scales far thinner than a human hair. Researchers hope DNA origami can be like surrogate hands on the tiniest scales, and if successful, the technology may be used to build useful devices smaller than any yet in existence. Making microscopic shapes out of DNA has a decades-long history, but newer techniques developed in the last ten years have further advanced the field. To make a particular shape, researchers first model an exact sequence of DNA base pairs on a computer — this takes about a week — and then synthesize the DNA from the ground up — taking another week. The base-pair sequence of a long strand of DNA determines how it can fold, while shorter strands of DNA act like staples, attaching different parts of the longer strand to one another. After being placed in a solution, the planned shapes — smiley faces, letters of the alphabet, whatever the researchers design — assemble themselves in a few hours without further human interaction. Caltech professor, Paul Rothemund, who developed DNA origami in 2006, has more recently been working toward DNA-based devices by sticking DNA origami onto chip-like surfaces. Using electron-beam lithography, the team etches a surface with “sticky” patches shaped to match a bit of DNA origami—a triangular bit of DNA, for example, will fit into a triangular patch. The DNA shapes can then settle in and stay put. The cool bit is that DNA can also bind to a wide range of molecules. In this case, the DNA was designed to bind fluorescent molecules, and the sticky patches were of a special sort — called photonic crystal cavities (PCCs) — made to magnify the light emitted by the molecules. Just how much the light gets magnified depends on precise placement of the DNA/molecule pair. If placement is only a little off, they won’t emit any light. Each cavity was made to bind anywhere from zero to seven pieces of DNA origami, corresponding to “pixels” of eight levels of brightness. Other attempts to make similar emitters have failed to yield more than a few successful lamps due to the difficulty of placing them just right, according to the scientists. The DNA-based method is more precise, and therefore, more successful. “It’s like using DNA origami to screw molecular light bulbs into microscopic lamps,” Rothemund explains. Shining together, these molecular light bulbs make up a dime-sized masterpiece. The team is next working on improving the lamps which currently “burn out” in about 45 seconds and only shine in a few different red hues. But the long-term goal is to take the techniques they’ve learned and use them to begin building tiny sensors or next-generation computing devices. If they can paint like van Gogh on molecular scales, then maybe they can do a lot more.